Unlikely? You bet. But still, according to the bookmakers, it’s 10 times more likely that Vardy now moves to Hollywood to become the new James Bond than it was for Leicester City to win the Premier League title at the start of the season. Vardy, freshly crowned the Football Writers’ Player of the Year, is currently available at odds of 500/1 to play the quintessential British action hero in the new franchise release. Leicester at the start of the season were 5000/1 to win the Premier League – by far, the longest odds offered on any winning team or individual in the history of professional sports. Earlier this season it was revealed that Adrian Butchart – the Hollywood screenwriter behind the Goal trilogy – wanted to make a movie about Vardy’s rapid rise from part-time football to the Premier League where he scored in 11 consecutive games, marking a new record. Vardy’s journey might well deserve to be chronicled but the collective Leicester City story has overtaken their striker’s one and surely deserves the Hollywood treatment. It’s Rocky, it’s Seabiscuit, it’s Cool Runnings if only the Jamaican bobsled team had actually won the gold medal at the 1988 Winter Olympics. Things like this, you don’t expect to happen in real life. And when they do, you laud them. You exhalt the participants who defied not only seemingly insurmountable odds but all sporting logic. You do something about it so people forever more will know about it. Let’s say it again; 5000/1. Kim Kardashian is currently available at 2000/1 to become the next president of the United States. League seasons don’t generally end with a bang and that sometimes serves to deaden the sensation of incoming title winners. It’s not a criticism to say that a league campaign lacks something of the buzzer-beating drama of play-offs or cup finals, merely an observation. Sergio Aguero’s injury time goal against Queens Park Rangers in 2012 to win the title for Manchester City is as dramatic as it could possibly get. There are 38 matches – that’s a long old slog – and as such there is usually plenty of time to become accustomed to one team or another being crowned the league champions. Most people felt when Tottenham Hotspur failed to beat West Bromwich Albion last Monday night that the Fat Lady sang. The 1-1 draw at White Hart Lane left Leicester seven points clear with only nine to play for. Throw in the fact that Spurs had to go to Chelsea and win – a result beyond their capabilities since 1990 – and Leicester’s title win felt as close to inevitable as could be. They didn’t beat Manchester United at Old Trafford to clinch the title for themselves but they left the sodden Manchester turf with the air of champions nonetheless. They were clapped off by the thousands of United fans who stuck around to the final whistle. Their fans sang long and forcefully into the evening – “Now you’re gonna believe us, we’re gonna win the league.” And they have. Down the final stretch, teams have come unstuck before. “The choke”. Most famously, Newcastle botched their title bid in 1996 when it appeared to all and sundry they would win it. Leicester went top on matchday 23 and every week since they were expected to falter. But they haven’t looked back. There was a wobble over Christmas and the New Year. Now they’ll go back to where they belong, it was reasoned. The natural order would be restored. Well, it was, but to a contrary extent. They re-emerged from their slump to win away at Spurs. Oh, what a vital win that looks like now. Since beating Stoke on January 23, Leicester have lost only one match – to Arsenal on February 14 – a game which many predicted would signal the beginning of the end. Arsenal, with their proud dressing room selfies, looked to have the momentum. Leicester, though, have won seven of 10 matches since then and have drawn the other three. Champions’ form. We have had the chance, then, to grow used to the once implausible idea of Leicester City becoming champions. Their title chances moved through all stages from impossible to unlikely, from improbable to inevitable. Claudio Ranieri remarked earlier in the season that 40 points and survival was the objective. How many league-winning managers have had to say that? There’s keeping expectations in check and there’s presiding over the greatest sporting outsider story of all time. So, let’s take a minute to appreciate what we are seeing. Here we are after 36 matches of the 2015-16 English Premier League season congratulating Leicester City for winning the title. It is the richest prize in football contested by some of the highest-paying sports teams on the planet. It is a closed shop won by only five different teams since 1992. Only one of those could be classed as an outsider – Blackburn Rovers in 1995. For the most part, it’s been a case of let the richest team win. Not now. Of course, the stars aligned for Leicester in the sense that the big teams couldn’t summon the consistency or the courage to do it this year. That takes nothing away from Leicester’s unique achievements. Leicester City were only promoted in 2014 and still feature many of the same players who came up from the Championship. 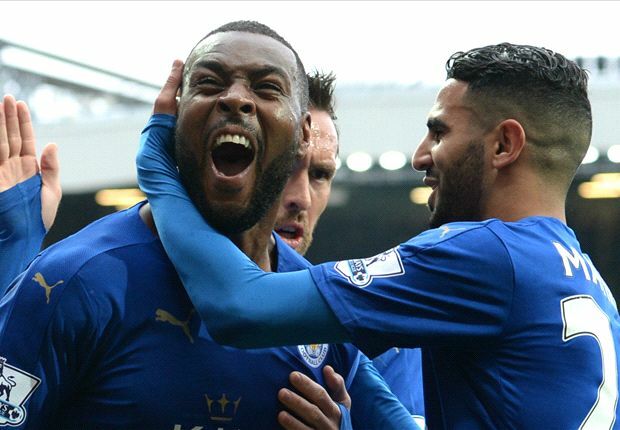 Wes Morgan, Riyad Mahrez and Vardy are just three; all were voted into the PFA Premier League team of the season. Mahrez, meanwhile, is the players’ Player of the Year while Vardy, of course, took the Writers’ award. Leicester City, who miraculously escaped relegation last term having won seven of the last nine matches, are now champions. Leicester City, who as recently as 2009 were in the third tier, are kings of all 92 English league clubs. Leicester City fans, who rallied to keep the club alive as recently as 2002 when it fell into administration with debts of £30m, are now planning their Champions League trips. Leicester City, who hadn’t finished in the top two since 1929, have won the bloody league. And Ranieri, sacked by Greece for losing to the Faroe Islands in his last job prior to this one, is the man who oversaw it all. Fans at the King Power Stadium on Saturday will rise to salute their Premier League champions in their final home game of the season against Everton. Leicester supporters will not have to bite their nails or worry how Spurs will do against Southampton a day later. The job’s done, the pressure’s off. They can sit back, relax and enjoy the show. And in a couple years’ time they can relive the story all over again when it makes it onto the silver screen.